Since my upgrade to Ubuntu 17.10 there's no option in the settings about what to do when the notebook-lid is closed any more. Before this function had the options "do nothing" and "suspend" and maybe "shutdown". The "do nothing" function did something: when the lid was closed, the display went dark and the screen was locked with the password. My question is how to change the setting so that it's like I'm used to, so that the screen just locks but doesn't suspend when closing the lid. Launch Tweaks, go to the "Power" section and disable suspend on lid-close. Undo the above steps before following this. Also, SAVE ALL YOUR WORK, the second command would require you to reboot. In Ubuntu 18.04 Gnome desktop, there is no option in the Settings utility for configuring the laptop lid close actions. 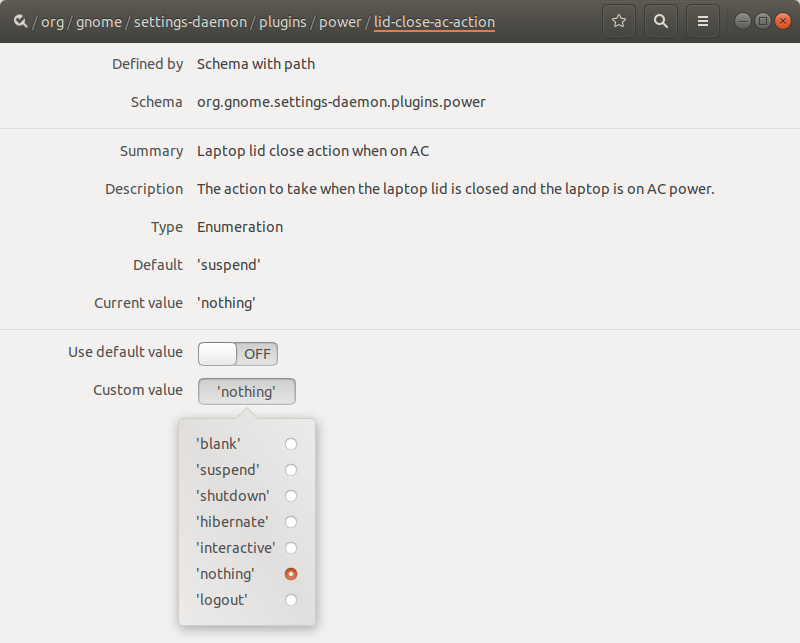 And Gnome Tweaks only offers a switch to enable / disable the "Suspend when laptop lid is closed" option. HandleLidSwitch=poweroff: shutdown / power off when lid is closed. HandleLidSwitch=hibernate: hibernate when lid is closed (need to test if hibernate works). HandleLidSwitch=suspend: suspend laptop when lid is closed. You could install dconf-editor to change what happens when lid is closed. 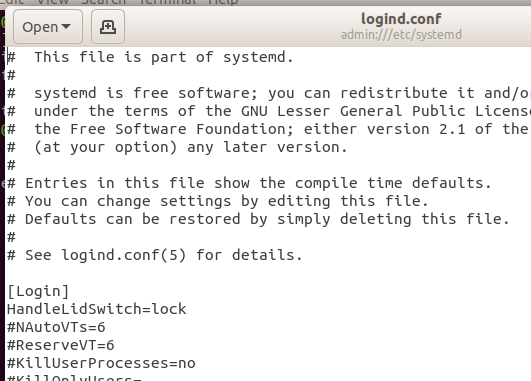 go to org.gnome.settings-daemon.plugins.power in dconf-editor. you can change the value of lid-close-ac-action and lid-close-battery-action for changing the action when lid closed.The possible values are 'suspend','hibernate','logout','shutdown','nothing'. Under the menu Power you can disable Suspend when laptop lid is closed. Not the answer you're looking for? Browse other questions tagged suspend power-management lid gnome-power-manager standby or ask your own question. How can I tell Ubuntu 18.04 to do nothing when I close my laptop lid? How to add “shutdown” to the list of “when the lid is closed” in power settings?